Donald Trump faces a climactic moment in his presidency this week with the impending release of Special Counsel Robert Mueller’s long-awaited report, which could provide an enduring portrait of how people view him and his 2016 campaign. The release of the almost 400-page document could help the president put two years of suspicion and risk from Mueller’s investigation behind him — or ensure that controversy over the Russia probe hangs over his re-election bid. The narrative Barr established may yet be turned on its head when a far more detailed version of the report is given to Congress and made public — and every page and paragraph is picked apart. It’s a moment that will shape American politics and policy, as members of both parties read over the pages for evidence that damns or vindicates the president. 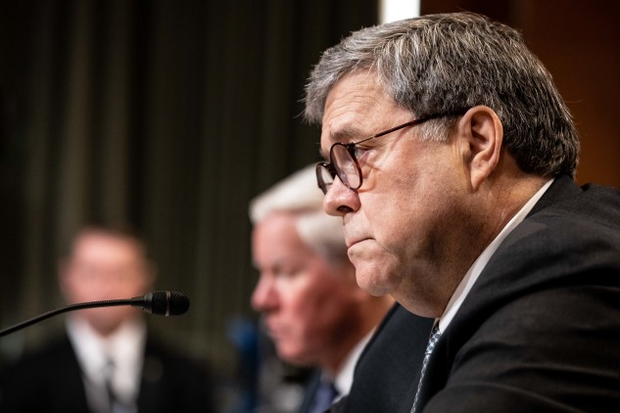 Barr has said he’ll blank out passages based on classified material, grand jury information and to avoid damaging “peripheral” figures who are private citizens, prompting House Democrats to authorize subpoenas for the full report and all the evidence behind it. Read more from Shannon Pettypiece. Barr Listens during a House Appropriations Subcommittee hearing on Wednesday. Pelosi and other Democratic leaders want access to the entire report and said they aren’t satisfied with Barr’s assurance that he will explain why he is redacting parts. They also slammed Barr’s recent testimony that he believes the FBI and possibly other U.S. intelligence agencies spied on members of Trump’s campaign. Read more from Ben Brody. Stone Attacks Indictment: Roger Stone, a sometime adviser and confidant of Trump, launched a blunderbuss attack on his indictment by Mueller, filing a flurry of papers late Friday claiming he was singled out for prosecution and demanding that his lawyers be allowed to see the special counsel’s final report. In six sometimes overlapping filings, Stone’s lawyers asked U.S. District Judge Amy Berman Jackson in Washington to throw out the case against him, arguing that Mueller’s investigation was improperly funded, that the special counsel himself was improperly appointed and that the lawmakers to whom Stone allegedly lied never asked Mueller to investigate that possibility. Read more from Andrew Harris. Now, as Americans finish filing to the IRS for the first time under the new system, the law has swelled the deficit and surveys show just one-fifth of taxpayers believe their taxes have gone down. That’s made it hard for Trump to leverage the tax cuts as an issue in 2020, when he’s up for reelection and his party will be seeking to retake the House of Representatives. Trump is going to try again today when he goes to Minnesota, a potential swing state in the 2020 election, to promote what Republicans consider their signature legislative achievement. It’s part of a week of events designed to promote the tax law’s effects on the economy as he turns to his next campaign. Read more from Sahil Kapur and Laura Davison. Chasing Trump’s Tax Return: Citing an “unambiguous legal obligation,” House Ways and Means Chairman Richard Neal (D-Mass.) set the IRS a deadline of April 23 to hand over Trump’s tax returns before potentially resorting to other legal options. Neal sent a second letter to the IRS on Saturday, asking for six years of Trump’s personal and business returns. He cited a section of the tax code that allows the chairman of the tax committees to request the returns of any taxpayer, including the president. “Please know that, if you fail to comply, your failure will be interpreted as a denial of my request,” Neal wrote. Read more from Laura Davison. Visiting the Rust Belt this early is a show of power for Sanders, putting his 17 Democratic rivals on notice that he has the money, name recognition and front-runner status to look past the initial primary states. Michigan doesn’t vote until mid-March, while Wisconsin and Pennsylvania vote in April. Sanders, who enjoys a cult-like base of support built during his 2016 run for the nomination, trails in polls only to former Vice President Joe Biden, who isn’t yet a candidate. Read more from Sahil Kapur. Buttigieg’s Pitch: Mayor Pete Buttigieg, an underdog in the 2020 Democratic presidential primary race who’s seen an uptick in support in recent weeks, this weekend called for a new generation of American leadership as he became the 18th candidate to formally join the fold. Speaking from a building with ties to America’s industrial past that’s now being re-purposed to house technology companies and other jobs of the future, the 37-year-old sold himself as unique in a field crowded with Washington lawmakers and long time politicians. “It is time to walk away from the politics of the past, and toward something totally different,” Buttigieg told thousands gathered inside a former Studebaker car assembly plant in South Bend, Indiana. The mayor, who has overseen that city since 2012, would be the youngest and first openly gay U.S. president, if elected. His northern Indiana community of about 102,000 people is best known for the nearby University of Notre Dame. Read more from John McCormick. Booker ‘Can’t Wait’: Sen. Cory Booker (D-N.J.) attacked Trump and urged social and economic justice — and legalized marijuana — to hometown supporters on Saturday as he tries to energize a presidential campaign that’s yet to catch fire. He also warned of a “box-checking competition” as Democratic candidates look for ways to stand out in a crowded field looking to take on Trump in 2020. Booker told about 4,000 supporters at a rally in Newark, where he served as mayor before being elected to the Senate, that clean water, environmental justice, jobs and better schools are “urgent” issues that will be central to his campaign. He pointedly criticized the Trump administration’s policies. Read more from Terrence Dopp. Goldman’s Take on 2020: Trump enjoys a “narrow advantage” over rival candidates heading into the 2020 election given the outlook for the U.S. economy, according to analysts at Goldman Sachs. Incumbent presidents carry a 5 to 6 percentage-point edge over rival candidates in the popular vote and Goldman Sachs’s economic forecast also leans in favor of Trump, although that is partly offset by his negative approval rating, economists Alec Phillips and Blake Taylor wrote in a report released late on Saturday. Read more from Simon Kennedy. Pelosi Asks for Extra Security for Omar: Pelosi said yesterday she’d asked the U.S. Capitol Police to provide more protection for Rep. Ilhan Omar (D-Minn.) after Trump tweeted a video of the lawmaker intercut with images of the Sept. 11 terror attacks on the U.S. “The President’s words weigh a ton, and his hateful and inflammatory rhetoric creates real danger,” Pelosi said in a statement. Pelosi demanded that Trump take down the post, which had been pinned at the top of his Twitter feed since Friday. By mid-afternoon the message had been removed, although at least one other anti-Omar retweet remained in Trump’s feed. And by then, the two-day-old video had been retweeted more than 86,000 times. Earlier, White House spokeswoman Sarah Huckabee Sanders said on ABC’s “This Week” that Trump bears no “ill will” toward Omar, who’s been subject to at least one recent death threat. Read more from Ros Krasny. Fundraising Numbers: Sen. Kirsten Gillibrand (D-N.Y.) raised $3 million in the first quarter of 2019 for her Democratic presidential bid, with the average online donor pitching in $25, according to figures released by her campaign, Bill Allison reports. The total is less than the $4.4 million Gillibrand raised in the first quarter of 2017 as she sought re-election to the Senate. Sen. Kamala Harris (D-Calif.) has said she raised $12 million from more than 218,000 individual contributions, while Buttigieg reported collecting $7 million. The campaign of Sen. Elizabeth Warren (D-Mass.) said she had raised $6 million, while Sen. Amy Klobuchar (D-Minn.) raised $5.2 million and Booker took in more than $5 million. Trump raised more than $30 million for his re-election effort, according to figures released by his campaign, and has $40.8 million in the bank, more than any of the active Democratic candidates have reported so far, Bill Allison reports. The Republican National Committee, which will be supporting Trump’s bid, raised an additional $45.8 million in the first quarter, the most it’s raised in a non-election year. Combined, the party and Trump’s committees have has $82 million in the bank, an unprecedented war chest this early in a presidential election contest. Meanwhile, Harris and her husband reported more than $2 million in income on their 2018 federal tax return, with the vast majority stemming from her husband’s work as a partner in a law firm. The senator released 15 years’ worth of tax returns yesterday, dating back to when she first held elected office, Laura Davison and Sahil Kapur report. EU-U.S. Talks: The European Union gave the green light to start trade negotiations with the U.S., as they seek to rebuild frayed relations a week after threatening each other with billions of dollars in new tariffs over a 14-year-old aviation dispute. EU ministers today authorized talks to eliminate tariffs on industrial goods, following through on a political accord reached in July between Trump and European Commission President Jean-Claude Juncker. The EU sought the agreement with the U.S. president, in part to avoid levies Trump threatened on foreign automobiles and car parts. Negotiations will start amid escalating transatlantic tensions, with the U.S. having accused the EU of not acting in good faith and delaying the start of talks. Trump’s car-tariff warning, which would be based on the same national-security grounds used for controversial duties last year on foreign steel and aluminum, will weigh heavily on discussions, with the EU bristling over the idea that it poses a threat to the U.S. Read more from Richard Bravo. Farmer’s China Fears: Some U.S. farm groups fear that Trump’s terms for easing his trade war with China risk leaving large swaths of American agriculture worse off than before the conflict began. Many producers are alarmed by signs that the administration would accept Chinese purchase target pledges for commodities like soybeans and pork without a promise to lift retaliatory tariffs, said industry representatives, some of whom spoke only on condition of anonymity to avoid consequences for publicly criticizing the administration. Farmers are unnerved by Trump’s enthusiasm for tariffs and his tendency to pick industry winners and losers, even as he promises in general terms to put “America first” in negotiations with the U.S.’s largest trading partner. “This is of great concern to producers out here facing another year of tariffs,” said Mark Powers, president of the Northwest Horticultural Council, which represents cherry, pear and apple growers in the Pacific Northwest. “We’re disappointed. Clearly the priority lies elsewhere.” Read more form Mike Dorning. Meanwhile, Treasury Secretary Steven Mnuchin said the U.S. is open to facing “repercussions” if it doesn’t live up to its commitments in a potential trade deal with China, in a sign that the two sides are edging closer to an accord. “There are certain commitments that the United States is making in this agreement, and there are certain commitments that China is making,” Mnuchin told reporters Saturday at the IMF meetings in Washington. Read more from Andrew Mayeda. Sanders Says to Ditch USMCA: Sen. Sanders this weekend called on Trump to abandon his new NAFTA deal. “The NAFTA treaty that Trump renegotiated with Mexico will still allow companies like General Motors to send our jobs to Mexico,” Sanders said during a rally at Macomb Community College in Warren, Mich. “So today, I challenge Donald Trump: For once in your life, keep your campaign promises,” he said. “Go back to the drawing board on NAFTA. Do not send this treaty to Congress unless it includes strong and swift enforcement m echanisms to raise the wages of workers and to prevent corporations from outsourcing American jobs to Mexico.” Read more from Sahil Kapur. Graham Plans Asylum Changes: Sen. Lindsey Graham (R-S.C.) said yesterday he’s working to change U.S. asylum laws for migrants crossing the southern border and would extend the time that children can be held. Graham, an ally of the White House who chairs the Senate Judiciary Committee, is floating the changes as Trump has again increased his rhetoric around immigration as a cudgel against his political enemies. Trump is considering relocating migrants to so-called sanctuary cities, his press secretary, Sarah Huckabee Sanders, confirmed yesterday. In addition to changing a court settlement that prevents children from being held for more than 20 days because “it’s impossible to do a hearing” in that time, Graham said on Fox News’s “Sunday Morning Futures” that his proposal would also allow the U.S. to send children back to Central American countries and change the standards for claiming immigration because so few of those who seek the status are approved. Read more from Ben Brody. Trump Slams Fed Again: Trump renewed his attack on the Federal Reserve, claiming the stock market would be “5000 to 10,000” points higher had it not been for the actions of the U.S. central bank. “If the Fed had done its job properly, which it has not, the Stock Market would have been up 5000 to 10,000 additional points,” the president tweeted yesterday. “Quantitative tightening was a killer, should have done the exact opposite!” Read more from Margaret Talev. Trump Backs Third Summit With Kim: Trump said relations with Kim Jong Un remain “very good” and he opened the door Saturday for a third summit, hours after the North Korean leader said he’s willing to meet as long as the U.S. offers acceptable terms for a deal by year end. “I agree with Kim Jong Un of North Korea that our personal relationship remains very good, perhaps the term excellent would be even more accurate,” Trump said Saturday in a tweet. “A third Summit would be good in that we fully understand where we each stand.” Trump said he looked forward to a day, “which could be soon, when Nuclear Weapons and Sanctions can be removed, and then watching North Korea become one of the most successful nations of the World!” Read more from Sohee Kim, Jihye Lee and Nick Wadhams. Meanwhile, South Korean President Moon Jae-in said today it’s time to prepare for talks with Kim. Moon, who has tried to be a bridge between Kim and Trump, said North Korea’s leader is committed to denuclearization and the U.S. president feels a top-down peace process is necessary for the divided peninsula. Kim and Trump’s February summit collapsed without a deal, with both sides blaming the other for the breakdown. Read more from Youkyung Lee. Trump Offers Boeing Some Advice: Trump gave Boeing a little advice this morning on Twitter. The company should fix its troubled 737 MAX and choose a new name following the Ethiopian Air Lines and Lion Air Crashes. “What do I know about branding, maybe nothing (but I did become President! ), but if I were Boeing, I would FIX the Boeing 737 MAX, add some additional great features, & REBRAND the plane with a new name,” Trump said on Twitter. “No product has suffered like this one. But again, what the hell do I know?” Read more from Terrence Dopp.